On June 11, 1963, President John F. Kennedy gave a televised address to the American people and announced that he would be sending a civil rights bill to Congress. His bill would become the most-far reaching act of legislation supporting racial equality in American history. Beginning in the 1950s, African Americans had been engaged in peaceful demonstrations to protest segregation and discrimination, but had encountered violence and resistance. The turmoil through the South prompted the president to take action. The Civil Rights Act of 1964 outlawed racial segregation in public accommodations including hotels, restaurants, theaters, and stores, and made employment discrimination illegal. President Lyndon Johnson signed the bill on July 2, 1964. This exhibit summarizes some of the historical events that influenced the passage of this legislation. The catalyst that ignited the modern Civil Rights Movement was the 1955 bus boycott in Montgomery, Alabama. When Rosa Parks was arrested for refusing to give up her bus seat to a white passenger, the black community organized a boycott of the city buses. After 13 months, the U.S. Supreme Court held that Alabama’s laws segregating buses were unconstitutional, and the boycott ended in success. During the Montgomery boycott, Reverend Martin Luther King, Jr. rose to prominence, and in 1956 the Southern Christian Leadership Council was created to coordinate and support non-violent protests against segregation and discrimination. The Civil Rights Movement was a grassroots effort, that took root as African American citizens decided to speak up, walk out, or engage in civil disobedience to bring attention to the racial injustices that permeated Southern society. In February 1960, students in Greensboro, North Carolina, began the sit-in movement, when they refused to leave a segregated lunch counter at a Woolworth’s store. Their actions set off a wave of sit-ins and other non-violent protests against segregation. Later that year, students founded the Student Nonviolent Coordinating Committee as an outlet for younger African Americans who wanted to take part in the movement. In 1961, the Freedom Riders risked their lives trying to desegregate interstate travel facilities, such as bus stations across the South. Beginning their rides in Washington, D.C., the riders were arrested in Charlotte, North Carolina, and they encountered increasing resistance as they traveled deeper into the South. In Alabama and Mississippi, the riders were beaten and arrested. The next year, violent vigilantes rioted in Oxford, Mississippi, as James Meredith, by order of the U.S. courts, enrolled in the traditionally white University of Mississippi. Although John F. Kennedy’s administration responded to civil rights protests that turned violent, such as sending federal troops to the University of Mississippi campus to quell the riots, it had been criticized for not doing enough to support African Americans fighting for social and economic equality. President Kennedy wanted to wait until his second term to send a civil rights bill to Congress, but events conspired to constrict his timetable. On the occasion of Vanderbilt University’s 90th anniversary, President John Kennedy stressed the responsibility of educated men and women to use their talents to help society. Photo courtesy of the John F. Kennedy Presidential Library and Museum. By the spring of 1963, simultaneous protests were taking place throughout the South, but the one attracting national and international attention occurred in Birmingham, Alabama. The city’s black community decided to follow a strategy used in Albany, Georgia, protesting discriminatory practices with mass marches and filling up the city’s jails. Birmingham’s Police Commissioner Eugene “Bull” Connor, a hard-line segregationist, responded to the peaceful protests with police force. President Kennedy was spurred into action as the Birmingham protests escalated. As photographs of police dogs attacking peaceful marchers and fire hoses being turned on children flashed across the country and around the globe, the Kennedy administration responded. In May 1963, the administration sent Burke Marshall, an official from the Justice Department, down to Birmingham, and he negotiated a short-lived agreement between business leaders and civil rights activists. That same month, on May 18, 1963, President Kennedy delivered a speech at Vanderbilt University in Nashville, Tennessee, in which he mentioned the movement and the struggle for equal rights. He referred to the complexity of the problem and the importance of assuring all Americans their rights under the law. Then on May 21, federal courts ordered the University of Alabama to admit two African American students, Vivian J. Malone and James A. Hood, for the summer session beginning in June. The governor of Alabama, George Wallace, was an avowed segregationist. In his inaugural address in January 1963, Wallace “drew a line in the dust and toss[ed] the gauntlet before the feet of tyranny,” declaring “segregation now, segregation tomorrow, segregation forever.” He pledged to block the entrance and prevent the university’s desegregation. Read Wallace’s full Inaugural Address from the Alabama Department of Archives and History Digital Collections. President Kennedy warned Governor Wallace against stopping the integration of the university, but on June 11, 1963, Governor Wallace stood in front of a university building to bar Malone’s and Hood’s entrance. Governor Wallace and U.S. Deputy Attorney General Nicholas Katzenbach engaged in a standoff, captured on camera, and President Kennedy mobilized the Alabama National Guard to protect the students and resolve the situation. Malone and Hood ultimately entered the building and registered for classes. Governor George Wallace (second from left) blocked U.S. Deputy Attorney General, Nicholas Katzenbach, from entering the University of Alabama. Photo courtesy of the Library of Congress. That night President Kennedy took to the air waves, speaking forcefully about civil rights. He announced his intention to ask Congress to act, declaring that a moral crisis existed in the country and requesting Congress to move forward with legislation to desegregate public accommodations and speed up the integration of public education. It [this nation] was founded on the principle that all men are created equal, and that the rights of every man are diminished when the rights of one man are threatened. On June 19, President Kennedy sent his civil rights bill to Congress. As the bill began to slowly make its way through Congress, civil rights leaders proposed maintaining the momentum by reviving an idea from the 1940s. In 1941, A. Philip Randolph and associates had proposed a march on Washington to protest racial discrimination in the war industries. The march never came to fruition because President Franklin Roosevelt signed an executive order that prohibited discrimination in national defense industries. Read President Roosevelt's Executive Order 8802 at the Franklin D. Roosevelt Presidential Library and Museum. In 1963, civil rights leaders including Martin Luther King, Jr., Roy Wilkins, and James Farmer decided to revive Randolph’s original idea. The March on Washington for Jobs and Freedom took place on August 28, 1963, when more than 250,000 demonstrators gathered in Washington, D.C., in support of job creation and civil rights legislation. Following the peaceful March on Washington, which featured King’s “I Have a Dream” speech, President Kennedy met with civil rights leaders at the White House. They discussed the event and the details of the civil right legislation moving through Congress. Roy Wilkins stressed their desire to have fair employment practices included in the civil rights package. They also stressed the importance of training and education. President Kennedy meets with civil rights leaders in the White House. Photo courtesy of the National Archives. Then on November 22, 1963, President Kennedy was assassinated while riding in a Dallas motorcade. 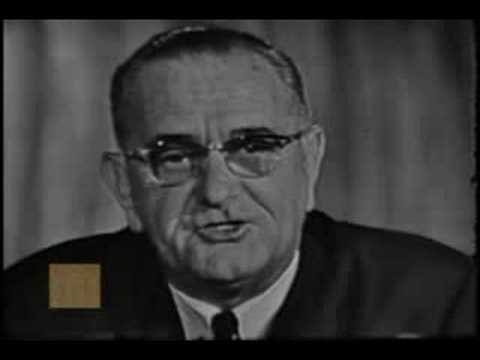 On becoming president, Lyndon Johnson took up the mantle of civil rights. In addressing a joint session of Congress five days after the assassination, President Johnson announced his intention to continue to pursue the passage of civil rights legislation as a tribute to President Kennedy. Using his leadership to lobby key senators, President Johnson forged a bipartisan coalition of northern and border-state Democrats and moderate Republicans. These Senators were able to offset a coalition of southern Democrats and right-wing Republicans, including an 82-day filibuster, and the bill passed in the Senate by a vote of 73 to 27 on June 19, 1964. President Lyndon Johnson recorded many of his telephone conversations during his time in office. Photo courtesy of the National Archives. That day, President Johnson called NAACP president, Roy Wilkins, to discuss the Senate’s passage of the bill. After sharing congratulations, the president asked Wilkins for his ideas about the statement Johnson would make during the signing ceremony. The two men talked about strategy for implementing the legislation, as well as how to handle southern governors and how to enforce the law in the old Confederacy. Two days later, President Johnson called House Minority Leader, Republican Charles Halleck of Indiana, to discuss bringing the bill up for a vote in the House. Johnson urged Halleck to pass the civil rights legislation, as well as his anti-poverty bill. Alternatively cajoling and joking with Halleck, Johnson made it clear that he planned to sign the act before the July 4th congressional recess. On July 2, 1964, a few hours after the House passed the bill, President Johnson signed the Civil Rights Act of 1964 in a televised White House ceremony. In his remarks, he noted the historic nature of the legislation and outlined his plan to implement the law. At the conclusion of his statement, he signed the bill using a number of different pens, which he then passed out to the bill’s supporters, including President Kennedy’s brother, Attorney General Robert F. Kennedy. Hear the full-length televised address. Rosa Parks refused to give up her bus seat in Montgomery, Alabama, in 1955. Her action launched the Montgomery Bus Boycott. Martin Luther King, Jr., rose to prominence during the Montgomery Bus Boycott in Alabama. Freedom Riders John Lewis and Jim Zwerg treated their injuries after being attacked in Montgomery, Alabama, in 1961.